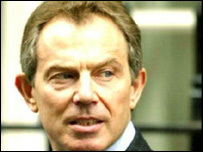 It was impossible for Tony Blair to do anything but concede an independent judicial inquiry into the death of David Kelly. The prime minister knew he had no other option. The issue of how Dr Kelly came to be at the centre of the post-war storm over Iraq, intelligence and weapons of mass destruction has suddenly, tragically, become too grave to do anything else. "Have you ever felt like the fall guy?" he was asked when he appeared before the foreign affairs select committee earlier this week. The question came some way through the meeting, by which point committee members had concluded - wrongly as it emerged - that he was probably not the source at the centre of the Alastair Campbell vs BBC row over "sexed up" intelligence information. Now the row has turned to personal tragedy, hard questions are being asked of the Ministry of Defence, Downing Street and government spin doctors. It was to his bosses at the MoD that Dr Kelly volunteered he had been in contact with the BBC's Andrew Gilligan. Within days his name was made public. Who did that? Ministers and Number Ten made plain their firm belief they had identified Mr Gilligan's "mole". The Ministry of Defence issued a statement that it was "99 per cent" sure of it. Defence Secretary Geoff Hoon and Mr Blair himself left no doubt as to their view, demanding that the BBC confirm or deny that Dr Kelly was their man. Only on Sunday 20 July, two days after Dr Kelly was found dead, did BBC director of news Richard Sambrook confirmed that the scientist had been the BBC's principal source for the story. It was against this background that he was called before the foreign affairs committee. "I accept the process," was the official's almost inaudible reply when asked if he had been set up by being thus thrust into the limelight. Inaudible because of his evident discomfort and nervousness; so quiet was his voice, the air conditioning was turned off because it drowned him out. In the course of his evidence, Dr Kelly was also asked for his expert view on the controversial government claim that Saddam Hussein possessed weapons of mass destruction that could be launched in 45 minutes. He cast doubt on it. None of this was how the government expected his committee appearance to turn out. Before the news of his death, Downing Street may well have thought pressure for an independent judicial inquiry into its handling of intelligence had safely passed. The calls had diminished, enough people wanted to move on, only the easily dismissed usual suspects were refusing to let go of the issue. Not any more. 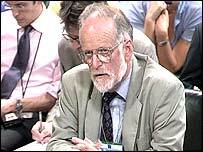 As Labour's Peter Kilfoyle, a minister in the MoD until he resigned, put it: "We don't know exactly what Dr Kelly's own frame of mind was in the build-up to his appearance before the select committee. "We don't know what his immediate reaction was to the cross-examination," he said. "We owe it to Parliament and the people, and not least to the family of Dr Kelly, to get to the bottom of this in a way which is completely untarnished.